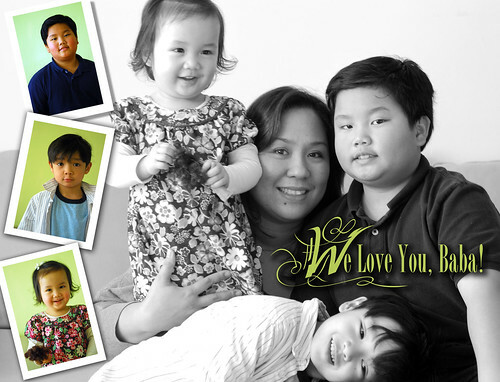 For my husband's birthday present, I asked my extremely talented artist brother to take pictures of the kids and I. And look what he came up with? It turned out beautiful! First off, this was all done in one day inside his home...He just started snapping away while the kids stood and be themselves. Within one hour, voila he came up with this. He's a genius! I love how he captured their normal facial quirks and smiles...their facial expressions and the composition of the all the pictures were just studio perfect (taken in his living room!). Not to mention that my husband loved it!!! By the way, "Baba" is "Daddy " in Chinese just in case you were wondering. So if anyone of you(in Chicago) would like a "true artist" to take your children's or family's photo (especially in the comfort of your own home), you should really look him up. Just check out his art works here. He's an artist-painter that has an amazing talent that freelances in photography and graphic design. awww that is a super sweet birthday present! What great pictures and gift. Pictures are my favorite. Awesome pictures MJ, I wish we're still there so that I can have pictures like that. Matthew is a good looking fella, Christian, gosh, he looks so mature now, and oh my, Katie, so pretty, (looks like you) she will be 2 in a few days..Time flies talaga..
MJ what a great gift! And the expressions on each of their faces are priceless! Those are lovely portraits and I'm sure your husband will cherish them.